Alfred Kantor was 22 when he was sent to Theresienstadt, the ”model ghetto” 40 miles north of Prague that the Nazis had created for Czech Jews. He was then sent to Auschwitz and, later, Schwarzheide. When the war ended, he was one of 175 prisoners out of 1,000 who survived a death march back to Theresienstadt. Once freed in 1945, he spent two months in a displaced persons camp, during which he recorded his experience in 160 drawings and watercolors. They were published in 1971 as The Book of Alfred Kantor. While in the Nazi camps, Kantor had made sketches of the things he saw. Some of these sketches he managed to save, but most he destroyed—the exercise of composition having committed the scenes to memory, which he was then able to recreate after the war. Few photographs of life in the concentration camps survive. Kantor’s is thus one of the few eyewitness visual representations we have of the conditions and atrocities of the Holocaust. Before embarking on Maus I consciously set about looking for material that could help me visualize what I needed to draw. The few collections of survivors’ drawings and reproductions of surviving art that I could get my hands on were essential for me. Those drawings were a return to drawing not for its possibilities of imposing the self, of finding a new role for art and drawing after the invention of the camera, but rather a return to the earlier function that drawing served before the camera—a kind of commemorating, witnessing, and recording of information—what Goya referred to when he says, “This I saw.” The artists, like the memoirists and diarists of the time, are giving urgent information in the pictures, information that could be transmitted no other way, and often at great risk to their lives…. Alfred Kantor was…an amazing resource. 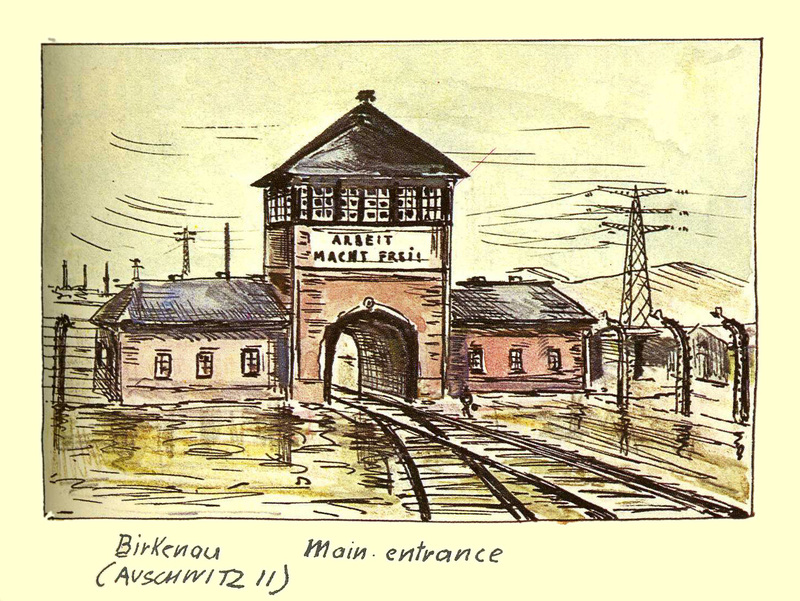 Kantor was a teenager in Terezin and Auschwitz, evidently drawing to keep himself sane, drawing what was around him. He destroyed most of the drawings he made while in Auschwitz, but reconstructed them while he was in a DP camp right after the war. At that point, now that the drawings would no longer cost his life, he redrew a visual diary of what he’d just gone through, He went on to a successful career in advertising. Late in his life a friend saw it and encouraged him to publish The Book of Alfred Kantor, which—for somebody with my doubletrack disposition toward reading and looking—was an important clue to the moment-to-moment texture of life in a death camp. Kantor was drawing many of the same places and situations my parents were in, so his book became indispensable. This entry was posted in Uncategorized and tagged 1940's, 1990's, 20th Century, Alfred Kantor, Art Spiegleman, Comics, Czechoslovakia, Drawing, Fathers, Holocaust, Judaism, Prisons, USA, WWII. Bookmark the permalink.